Backpacking Zanzibar. Stone Town for low-cost and independent travellers. The streets in the old neighborhood of Stone Town was our favourite attraction. Just walk, get "lost", enjoy people´s life, children and schools, markets, men heading to mosques... Seat down side by side with locals when it cools down in the evening and small food stalls open in the neighborhoods. Stone Town houses have benches and stairs on the sides, to relax, chat, observe. Great in this global world, this village atmosphere in such a big city. In Stone Town, around the old area, it´s getting really very hard to get a room for less than 20 $ or 30.000 Sh and a dorm for less than 15 $! And for that price it will be with shared WC and quite basic (in Tanzania mainland you get a nice room for 10 $!). Don´t count to much in finding such a cheap room in a lodge that appears in the guide-books, popular, as prices are getting higher and higher. You can try! A few new lodges are opening but prices start often around 40 $/room. Now, also more rooms offered in www.airbnb.com, with some around 20-30 $/room.It can be a good option for Stone Town too. Check. Sometimes as it happened to us, a guy can follow you and later ask for money to the owner saying he brought you there... In that case, it didn´t work. Just keep calm! 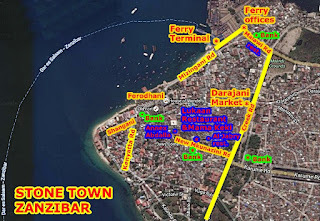 New Mkunazini Rd (near the Old Slave Market): a good area to find some affordable accommodation in Stone Town (old town. - Delicious Cake or Mama Keki: where we stayed. Price: 25 $/ double room shared WC (breakfast included). We paid 20$ (32.000 Sh), we got a discount without breakfast. The room is basic, correct, shared WC not too clean but ok. Very central location in old town, close to Darajani Market and dala-dala stop (Creek Rd), in New Mkunazini Road, just next to Lukmaan Restaurant and south of the Old Slave Market. Heidi, the owner (from Denmark) is in Airbnb and she gives details so we walked directly to her place. - Annex of Abdallah Guesthouse: a cheap lodge, just turn right at the end of New Mkunazini Road, in front of the mosque (Hanafi Sunni). Price: 25 $/double room shared WC, breakfast included. If no breakfast you can get a discount around 22 $ or 37.000 Sh. - St Monica´s Hostel: 35$/double room (just near Old Slave Market, in an old nuidling). - Flamingo Guesthouse: 30$/double room and 15$/dorm (south, on Mkunazini Street). Malawi Road and surrounds: maybe also cheap rooms in this area. Malawi Road is the busy street just north of the port (from the ferry offices to Darajani- Creek Road). It seems that there are a few cheap hotels around, rooms around 30.000- 35.000 Sh or maybe less. We didn´t check too much. Try to ask around, in shops or restaurants around (like Passing Dhow Restaurant). Shangani: don´t expect to much to find a cheap room around this super tourist neighborhood. Tourist restaurants are quite expensive (most dishes are around 15.000 Sh or in US$), concentrated around Shangani Street and the waterfront. If looking for local cheap food, a few options, most of them not far from Darajani Market area (restaurants and simple and noisy food stands, around bus stops and market) and New Mkunazini Rd and Malawi Rd. Lukmaan restaurant: always full of local people and very popular with foreigners too. Buffet style, so quick service. Clean. Small terrace. You get a complete dish for around 5.000 Sh. In New Mkunazini Road. Everybody knows the place, just ask. Super recommended! Al-Jabry restaurant: similar, just near Lukman, on Tharia street. Ask. They close quite early in the afternoon, when food is finished. Malawi road: other local restaurants (convenient if taking the night ferry), like Passing Dhown. Forodhani Gardens: we didn´t go as we prefered the local atnosphere of our neighborhood in New Mkunazini. The gardens are famous for its food night market. It´s on all the book-guides, so many "mzungus" around and prices tend to get higher than usual. New Mkunazini Road: in the evenings, they open small food stalls. Many women doing breads and pancakes just right at the end of the street. Fish, chicken, octopus. Darajani market: you will find fruits, vegetables, bread, fish, clothes, small shops. Different sections in Creek Rd. Bargain! Also small shops in the neighbourhoods. No supermarkets in old Stone Town (like often in Tanzania). Water: many locals go to the fountains to refill water in Stone Town. We did the same at the beginning, but water was not good, quite salty. So it´s better to buy water in the shops (1.000 Sh/1.5l or 4.000 Sh for 10-12 l). 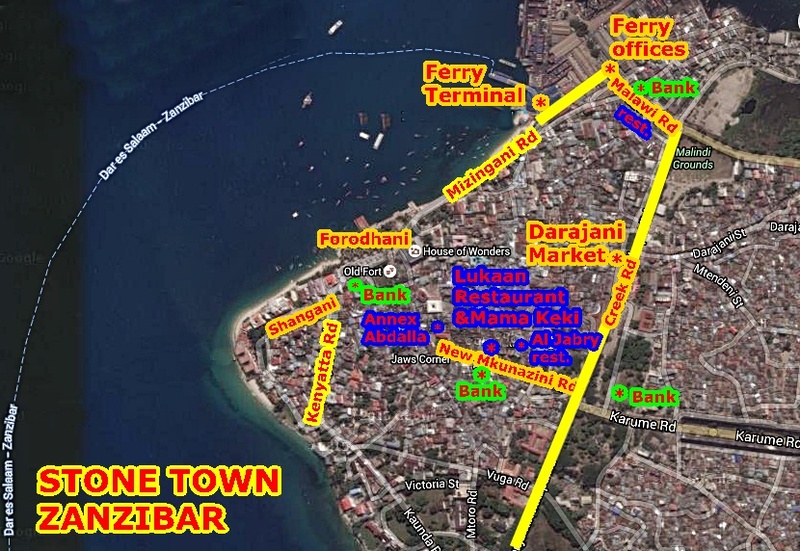 It´s the only place in Zanzibar where you will find ATMs, don´t forget to withdraw cash before heading to the beach! We saw one ATM in New Mkunazini Road, one in Creek Road (lights crossroad, near dala-dala stops), one west of Old Fort and also on Malawi Road (near the ferries companies). Many money changers around the old town. Dala-dalas: the cheapest way to move around Zanzibar. Vans, small trucks and mini-buses going to the main towns and beaches of Zanzibar (destination names on the front). Departure when full, from sunrise till sunset. It´s more confortable to travel in minibus than in small trucks and same price, so try to wait for one. Price is 2.000 Sh, from Stone Town to Nungwi, Matemwe, Paje, Jambiani, etc., to final destinations, and 500 Sh for shorter trips. It takes around 1 h- 1h30 from Stone Town to the different beaches. Don´t pay extra for the luggage, the locals never do! Taxis are quite expensive to get to the beaches. For exemple, around 20 $- 35.000 Sh from Stone Town to Paje (50 km). Tourist vans-shuttles: mainly around Shangani (Stone Town), near the hotels. Not that cheap. Rent a car o motorbike: around Shangani, many signs. Also popular to rent a motorbike in the beaches. But not so cheap. Around 30 $. International license needed expect police controls. Keep in mind that the old neighbourhood in Stone Town is quite compact and nice to walk. Small streets, pedestrians even if many motobikes and bicycles. You don´t really need transport inside old Stone Town. No real need of visiting tourist attractions, Stone Town is more about feeling it! So walk without direction, get lost, discover. Main tourist attractions have a fee and are not always very well maintened or of real interest. House of wonders& Palace Museum, 6.000 Sh- 4 $; Old Slave Market (just a church under renovation),7.000 Sh-5$; Hamami... We didn´t go. The Old Customs House&Old Dispensary (colonial buildings), close to the ferry terminal, have both free exhibitions. The Old Fort is free to visit, many souvenirs shops inside, concerts at night and festivals (but entrance fee and quite expensive). Walk the streets in Mkunazini area (near the Old Slave Market): real and authentic local life in its streets and squares like Jaws Corner. It´s less touristic than Shangani. Interesting to see men playing domino, children heading to school, markets. Shagani: where most of the tourists concentrate (northwest of the old town), around Shangani Street and Kenyatta Road. Many coffee shops, expensive hotels, souvenirs shops, traffic. We found the place just one more. No real local interest there. Just a few colonial buildings south of Shangani St (goverment buildings). Observe all the details of the wooden doors in the old tows and big old houses. Many. Visit the luxury hotels in Shagani and other boutique hotels in the old town. Usually no problem to go inside and look, it´s free! Even sometimes, possible to go upstairs and enjoy the views of Stone Town. Forodhani Gardens: good place to relax during the day, seat in the park, in the waterfront. Touristic place, but also many local people and sea breeze. In the waterfont, there´s some sand but no real "beach" and the sea is quite dirty. Many boats offering tours to Prison Island and Sand Island (you shouldn´t pay more than 10 $/pp, negotiate; we didn´t go).